By the early part of the twentieth century, the work of mathematical logicians such as Gottlob Frege, Bertrand Russell, and Alfred North Whitehead had honed the axiomatic method into an almost machine-like technique of producing mathematical theorems from carefully stated first principles (axioms) by means of clear logical rules of inference. 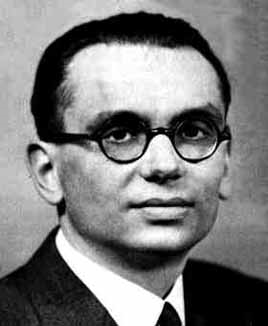 In 1931, however, Kurt Gödel (1906–1978), an Austrian logician, uncovered a surprising limitation inherent in any axiomatic system intended to produce theorems expressing the familiar mathematical properties of integer arithmetic. Here, the premiss ‘It is raining’ is not stated, perhaps because on the particular occasion it will be too obvious for words. In some enthymemes, it is the conclusion that is not explicitly stated, and again the reason may be that it is obvious. For instance: ‘It is raining, and if it is raining I will take my umbrella.’ At that point enough has been said for the purposes of normal conversation. — The Penguin Dictionary of Philosophy (Penguin Books, 2005), 189-190. If I miss the train, I take a taxi. I didn’t take a taxi. Therefore, I didn’t miss the train. Definitions, but not examples, taken from Antony Flew, ed., A Dictionary of Philosophy, rev. 2nd ed., 236. — Peter Singer, The Oxford Companion to Philosophy, 198. Natural languages may be thought in various ways to be ‘logically imperfect.’ Certain grammatical forms may mislead us about logical form; thus, ‘It is raining’ looks as if it refers to something (‘it’). More radically, certain concepts may even involve us in contradiction or incoherence. For example, Tarski argued that the ordinary concept ‘true’ did this, since it generated such paradoxes as the liar. A logically perfect language would be one lacking these faults, as well, perhaps, as some other ‘defects’, such as ambiguity and redundancy. Frege attempted to create such a language (the Begriffsschrift [concept writing or concept notation]), in which to couch the truths of logic and mathematics. Rather later, the Logical Positivists were interested in the idea of a logically with which to express the whole of natural science. The wedding of philosophical mathematics and a graphic novel seems an ideal marriage. What in other forms of media could be an overlong, tedious tale, can spring to life and breathe in an illustrated story. That’s my impression after reading Logicomix: An Epic Search for Truth. Logicomix tells the story of mathematician and philosopher Bertrand Russell’s decades-long search to establish an unshakeable foundation for mathematics in logic. Russell narrates his own life story and describes his quest, which began in childhood and continued well into his adult life. Along the way, he interacts with some of the greatest logicians, mathematicians, and philosophers of the early twentieth century—Ludwig Wittgenstein, Georg Cantor, G. E. Moore, David Hilbert, Kurt Gödel, Alfred Whitehead, and Gottlob Frege. While the quest comprises the main storyline, the authors also shed light on Russell’s private life, which had its fair share of drama and conflict. Having a family history of mental illness, one of his greatest ongoing fears was losing his mind. (On a side note, nearly all of the thinkers mentioned above contended with a serious mental illness.) Russell was married four times, though the book only features his first two wives, and his well known affairs are hinted at. Though his contributions to mathematics and logic were considerable, he came to see his original quest as a failure, especially in light of Wittgenstein’s criticisms and Gödel’s Incompleteness Theorem (which the authors explain in the text and in a helpful glossary of terms in the back). At the same time, the authors suggest that Russell was admired for his pacifism, his endeavoring to apply reason and logic to every area of human activity, and his ideas, which influenced a younger generation of mathematicians such as Alan Turing, who helped break the German “Enigma” code in World War II and whose work importantly influenced the development of the digital computer. An interesting and intentionally ironic literary device used by the writers is inserting themselves into the story, so that the reader follows the process (interspersed occasionally) of the writing of Logicomix along with Russell’s story. Logicomix is thus self-referential, which characteristic also lies at the heart of “Russell’s Paradox” (also nicely described in the glossary). At the end of his life, the Russell of Logicomix arrives at the conclusion that much of human nature and behavior can’t be explained or captured by logic, and that no single system can encompass the multi-faceted nature of reality. He declares, “If even in logic and mathematics, the paragons of certainty, we cannot have perfect assurances of reason, then even less can this be achieved in the messy business of human affairs—either private, or public! . . . Wittgenstein has a point, you see: ‘All the facts of science are not enough to understand the world’s meaning.’” (p. 296). While the authors admit that they have taken some liberties with the reconstruction of Russell’s life, the major characters “are based as closely as possible on their real-life counterparts” and no liberties were taken with “the content of the great adventure of ideas which forms our main plot.” (p. 315, 316). I was pleased to know this, since a mainly fictional account wouldn’t have interested me nearly as much. 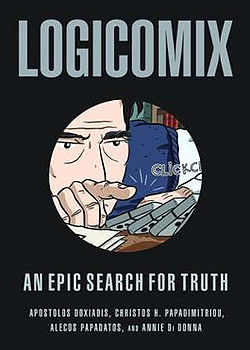 Logicomix succeeds, in my view, in shaping a fascinating story out of complex and abstract ideas. The story is epic, recounting some of the most important events in philosophy and mathematics in the last century, while also capturing the very human face of that unfolding drama. Who said comic books couldn’t be educational? Thanks to Bloomsbury USA for this review copy.